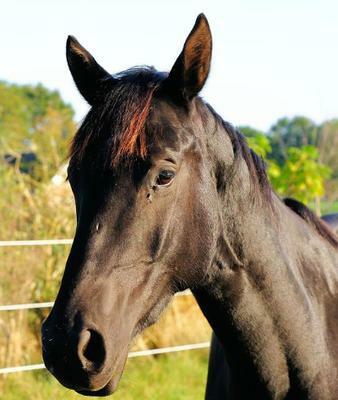 Talon was a strong, handsome stallion, with a silky black coat and a white star on his forehead. He really looked like a movie star. I hurried towards his pen, mum and dad hot in pursuit. I was still getting over it that I was allowed to get a horse, I was still shocked, and amazed. A young blonde girl shot in front of me, and at Talons pen, started jumping up and down, squealing excitedly and pointing to what she claimed her horse. "My horse, my horse!" She giggled. I stood there, shocked, while the manager, Mr. Duffy, and her father, came over. In less then five minutes, a brand new lead line was handed to the girl, and she waltzed out of the stables. I felt tears prick to my eyes, but then I remember there were other horses. I looked through the pens, only finding a Shetland pony, and a naughty, stubborn quarter horse. I sighed, feeling somewhat defeated. "Can I show you something?" Mr Duffy came up to me, and I turned to mum and dad. They had just been talking to him, and nodded encouragingly. I followed the manager out of the stables, and around to a small paddock. A dapple grey draft horse stood at the corner of the paddock. "He's very big," I pointed out, which was true. "His hasn't been ridden yet, he arrived here last week, and nobody wants him," Mr. Duffy said, sadly. "What will happen if nobody gets him?" I asked, nervously. "He'll have to go, and he'll pull off a plough for the rest of his days," Mr Duffy shrugged, and took his hands off the railing. Mum and dad stood at the stables, and then smiled at me. "Wait," I called after Mr Duffy, "I guess, a ride won't hurt." It was wonderful, sitting on top of Beau made me feel so strong and proud, yes, I may of looked a little silly, but I felt unbeatable, and strong, and brave. BEAU was the sweetest horse you would ever meet, with a big heart, and a glossy mane. That, was the best decision, I have every made. I think that you are good at writing and that you should write more. I hope you'll write more. You have a good style. It would be great to expand the part about getting on Beau the first time too. Hope you'll continue writing!